This film supposedly had three screenings at the Ansley Mall Film Forum, an independent art house/revival house in Atlanta, sometime in 1972. 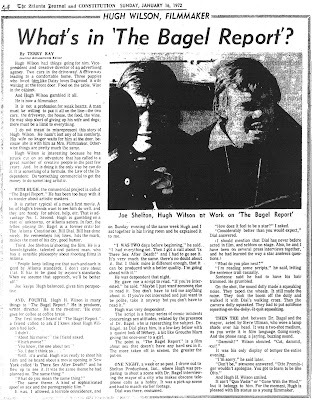 After scrolling through 4 years of The Atlanta Journal-Constitution on microfilm (1972-1975), we found no evidence of these screenings nor any other theatrical exposure for THE BAGEL REPORT in Atlanta during those years. "Mondo Mandingo" by Paul Talbot -- Now Available! Hippie psychos on a mad murder spree! "EEEK! Scream Night at the Drive-In"